Weed Anatomy provides a comprehensive insight into the anatomy of the globally-important weeds of commercial significance. Commencing with a general overview of anatomy, the major part of the book then includes sections covering monocotyledons, dicotyledons, brackens and horsetails, with special reference to their anatomy. Weed Anatomy Monograph 3: Amaranthus retroflexus L. and Amarantus palmeri S. Wats. Weed Anatomy Monograph 4: Ambrosia artemisiifolia L.
Weed Anatomy Monograph 5: Apera spica-venti (L.) P. Beauv. Weed Anatomy Monograph 6: Avena fatua L. and Avena sterilis L.
Weed Anatomy Monograph 7: Bidens pilosa L. and Bidens tripartita L.
Weed Anatomy Monograph 8: Bromus secalinus L., Bromus sterilis L. and Bromus tectorum L.
Weed Anatomy Monograph 9: Calystegia sepium (L.) R. Br. and Convolvulus arvensis L.
Weed Anatomy Monograph 10: Chenopodium album L.
Weed Anatomy Monograph 11: Cirsium arvense (L.) Scop. Weed Anatomy Monograph 12: Conyza canadensis (L.) Cronq. and Conyza bonariensis (L.) Cronq. Weed Anatomy Monograph 13: Cynodon dactylon (L.) Pers. Weed Anatomy Monograph 14: Cyperus esculentus L., Cyperus iria L., Cyperus rotundus L. and Cyperus serotinus Rottb. Weed Anatomy Monograph 15: Digitaria sanguinalis L.
Weed Anatomy Monograph 16: Echinochloa colonum (L.) Link and Echinochloa crus-galli (L.) Beauv. Weed Anatomy Monograph 20: Galium aparine L.
Weed Anatomy Monograph 23: Myosotis arvensis (L.) Hill and Myosotis palustris (L.) Nath. Weed Anatomy Monograph 24: Paspalum dilatatum Poir. Weed Anatomy Monograph 25: Phalaris minor Retz. and Phalaris paradoxa L.
Weed Anatomy Monograph 26: Poa annua L.
Weed Anatomy Monograph 27: Polygonum amphibium L., Polygonum aviculare L. and Polygonum lapathifolium L.
Weed Anatomy Monograph 29: Setaria faberi Herrm., Setaria glauca (L.) Beauv. and Setaria viridis (L.) Beauv. Weed Anatomy Monograph 30: Sorghum halepense (L.) Pers. 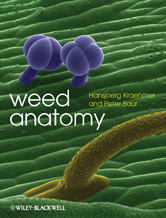 Weed Anatomy Monograph 32: Xanthium strumarium L. and Xanthium spinosum L.